Marrowstone Point the east point at the entrance to Port Townsend, is low at its extremity, but rises abruptly to a bluff about 120 feet high. The buildings of the former Fort Flagler, now a recreation area of the Washington Parks system, are about 0.5 mile to the south. The fort pier, with depths of about 20 feet at its face, is in poor condition. A fish haven is near the pier in about 48°05'28"N. 122°41'23"W. Marrowstone Point Light (48°06'06"N., 122°41'16"W.), 28 feet above the water, is shown from a 20-foot white square structure on the east edge of the point. Pilings from former piers and anchor pilings for wartime submarine nets extend up to 500 yards offshore 0.6 and 1.6 miles west of the light. Bush Point 8 miles south-southeast of Admiralty Head, is marked by a light at the end of a low sandspit. Back of the spit the land shows as a low timbered point from north or south. The flood current is reported to set strongly toward Bush Point. In 1983, Puget Sound Traffic Lane Separation Lighted Buoy SC, about 1.1 miles west of Bush Point, was reported to submerge during periods of strong currents. Tidal Current Charts for this area should be consulted. Several rocks lie nearly 0.2 mile offshore 1.1 miles southeast of Bush Point. Mutiny Bay between Bush Point and Double Bluff, affords temporary anchorage near the center in 10 to 20 fathoms. This anchorage is useful if overtaken by fog. The extremities are clay bluffs, and the center is low with extensive flats. Several sport fishing resorts are in the bay. Some have marine railways and can make minor repairs to outboard engines, and most have gasoline, water, and ice. Strong tide rips, at times dangerous for small craft, occur off Double Bluff, particularly on the ebb with strong northwest winds. There is frequently an eddy in Mutiny Bay; tidal current charts should be consulted. Foulweather Bluff on the east side of the entrance to Hood Canal, is one of the most prominent cliffs in Puget Sound. The north face, which is bare, is 0.5 mile broad and consists of vertical, grayish sand and clay bluffs, 225 feet high, sloping off on the east side to a bluff 40 feet high, but on the Hood Canal side the point is steep and high. A marsh, enclosed by a sandspit and marked by a light, extends about 500 yards from the base of the bluff on the Hood Canal side. The top of the bluff is fir and underbrush. There are several boulders which bare within 100 yards north of the highest part of the bluff, and a shoal covered 2 to 18 feet extends 200 yards east from the extremity and in line with the face of the bluff. If overtaken by fog, a vessel can find temporary anchorage 0.5 mile north of Foulweather Bluff, in not less than 60 feet. A lighted bell buoy marks the shoal 0.4 mile north of the bluff. At times the tide rips north of and around Foulweather Bluff are sufficiently heavy to be dangerous to small craft and to break up log rafts. This is most dangerous when the ebb current from the main body of Puget Sound meets that of Hood Canal off the point, and particularly so with the ebb against a strong north or northwest wind. Double Bluff marked by a light, consists of bare, white cliffs, 300 to 400 feet high on its southeast face, but much lower on its northwest face. A lighted buoy marks the extremity of the shoals 600 yards west of the bluff. The shoals are usually marked by kelp. Norwegian Point low and rounding, is about 0.2 mile northwest of Hansville. 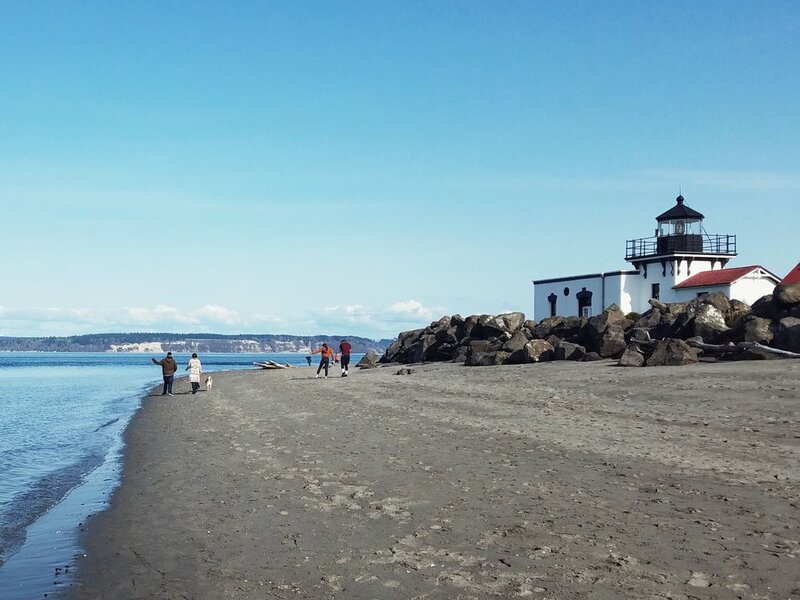 A conspicuous privately owned lighthouse, 210 feet above the water and built from plans of the original lighthouse at Mukilteo, is about 1 mile west of Hansville. Point No Point on the west shore of the sound about 3.5 miles southeast of Foulweather Bluff, is a low sandspit. Point No Point Light (47°54'44"N., 122°31'37"W.), 27 feet above the water, is shown from a 20-foot white octagonal tower on the end of the point.